It’s hot outside, y’all. We finally broke down and turned on the air conditioning for the first time this summer, meaning our stove is on vacation until the crisp air of autumn returns. I’m not complaining about my lack of stove burners, mind you. Summertime is the best time to take advantage of all the produce growing in my garden or in my CSA basket, and cooking those fresh flavors seems like a crime. The best summer recipes are cool and crisp. Lately, I’ve been digging into lots of watermelon (no shocker there, right?). They’re just so good this year — fresh, juicy, and ever-so-sweet. More than one meal this week has consisted of watermelon, forks, and the rocking chair on my front porch. That doesn’t mean that’s the only way to dig in to a watermelon. These big beauties can be used in anything, from agua fresca to pickles (seriously, try it). 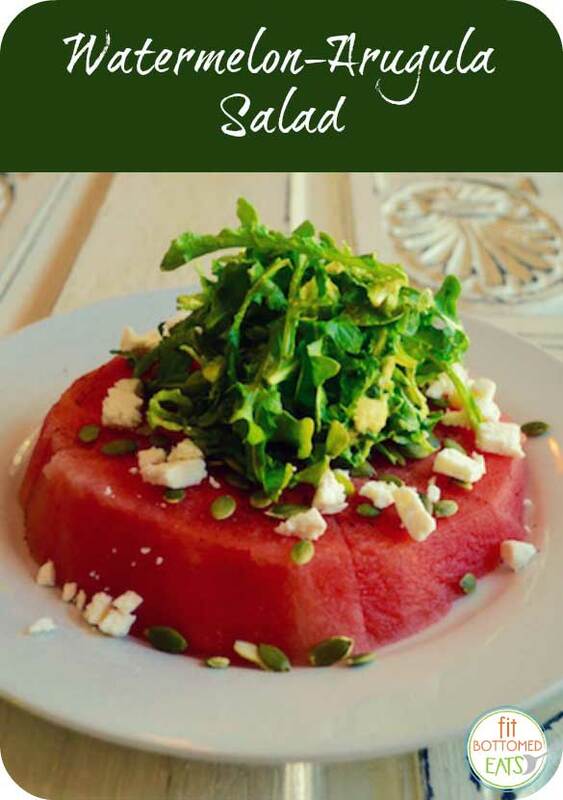 When I have friends over for dinner in the summertime, it’s easy to dress up the watermelon with a simple salad recipe. The peppery arugula pairs well with creamy avocado, while vinegar and smoked paprika add a great contrast to the sweet watermelon. Pumpkin seeds give some textural variety, too. If you’re into cheese, the saltiness of the feta is an amazing way to tie this salad together (for the lactose-intolerant, vegan, or otherwise cheese-free folk, a pinch of salt can be substituted). The best part? Not a single stove burner needs to be lit to make this tasty salad. In a bowl, mash together avocado and white wine vinegar until well blended. Add arugula to bowl and toss to coat leaves with avocado. Place watermelon slice on a plate. Cut into quarters, if desired. Sprinkle paprika on watermelon slice. Pile dressed arugula in center of watermelon slice. Top with pumpkin seeds and feta, if desired. Looks delicious!! Thanks for sharing.